When the competitive season is winding down allowing more time for training to stay in shape or more time for getting out of shape. The choice is yours if you want to improve in the off-season or just run the status quo one more year. I’ve been talking to a lot of people over this past season and it seems like ‘getting in shape’ to ride is actually catching on. For decades it’s been riding to get in shape, but thankfully that is changing. This summer I’ve had a lot of people ask me a lot of questions about diet, training and supplementing for performance. I’m stoked to see that people are starting to understand that the best way to improve riding is by improving your conditioning. Being in shape will make you faster than a new suspension, bars, tires or whatever else you throw at your bike. Besides the questions I get about the new sports supplement HemoFlo™ and how it reduces arm pump and delivers more oxygen and nutrients to your working muscles, the next big topic that usually comes up is how to train the core. The ‘core’ is really the central focus of any motocross rider because this group of muscles is responsible for stability, strength as well as postural endurance. If you have a well-trained core you’ll be way more stable and strong on your bike, especially if things get out of hand in sections of the track like the ruts and braking bumps. A strong, well-conditioned core translates into more speed particularly later into the moto. So with all the people asking about a specific routine for the core, I thought I’d get right to it and deliver the goods. Some people might not include Gluteus Maximus and Psoas Major (hip flexor), but the help to stabilize the pelvis and play a significant role in the lower back positioning and health, so I classify them as core muscles. Because motocross is so unpredictable you have to train your core to react instantly to things like rough off cambers, braking bumps, and of course radical holeshots where other riders are slamming bars to charge through the first corner. Strength, stamina and another facet known as proprioception are all important in training your core. We all know what strength and stamina but you may not have a grasp on proprioception. Proprioception is your inner sense that indicates whether the body is moving with the required effort, as well as the relationship of where various body parts are located in relation to each other. Because the core muscles have a mix of fiber types, various repetition protocols are required to fully prepare your core for battle. Slow twitch muscle fiber is very resistant to fatigue and is responsible for low effort, high frequency movement. When you sit up or stand up, slow twitch muscle fibers are working to keep your body in place. Fast twitch muscle fibers produce a high amount of force, but unfortunately can’t work for very long before fatiguing. This fatigue many times is felt as the common lactic acid burn. The more lactic acid that is produced, the less work your muscles can do. Because motocross requires endurance and strength, the repetitions used when training the core have to be staggered. There is a certain amount of heavy resistance with low reps as well as lower resistance with higher reps. To finish off an effective core program, you must also teach your body better proprioception, and I have always taken the exercises and had athletes close their eyes while doing them. It’s a whole new teaching method that will put you above the competition… and fast. Technique: Place your feet wide on the floor for stability while allowing your spine to stretch over the ball. With your abdominal muscles only pull your body up into a fully crunched position. Technique: With a wide stable stance, reach down across your body and grab the Kettlebell. 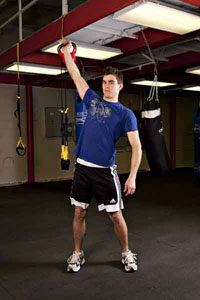 With explosive core power lift the Kettlebell across your body and overhead with a fully extended arm. Return the Kettlebell to the start position. Technique: With your legs hanging in a still position, bring your knees up to your chest while rotating your pelvis. Slowly return to the start position. To recruit more obliques, raise your legs to each side while rotating your pelvis. Advanced trainers can do this with leg extended. 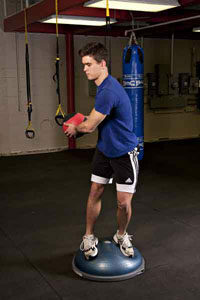 Technique: Gain your balance on the Bosu ball. Have a partner toss the ball to each side of your body. Catch and control the ball, following this with an explosive throw back to your partner. 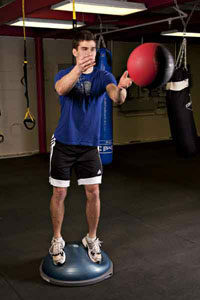 Beginners can eliminate the Bosu ball for more stability. There are many exercises that can be incorporated into a core program, but I consider these the ‘Core for the Core’. Train these muscles 2-3 times per week maximum and let them recover so that come race day… you’ll dominate the track not the other way around!